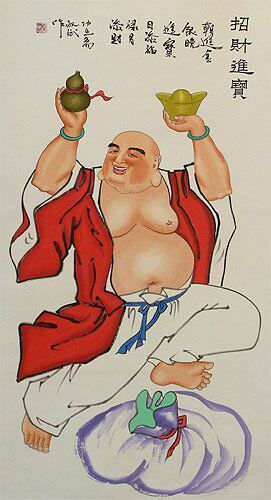 Artwork Panel: 53cm x 96.5cm ≈ 20¾" x 38"
Silk/Brocade: 62.5cm x 153.5cm ≈ 24½" x 60½"
Width at Wooden Knobs: 71.5cm ≈ 28"
This depicts the Happy Buddha. The actual title in Chinese is "Zhao Cai Jin Bao", which literally means "Bringing Money and Treasures". It's a good luck title that suggests this painting will bring such treasues to you.